an image on a screen. A friend of mine often reminds me to look for and savor the little joys of life. Lately, though, I've found this harder to do. After two weeks of being relatively home-bound due to recent health complications, I've gotten fed up with blobbing on the couch while the world seems to speed on by. Don't get me wrong -- I do still love my Food Network and podcasts, which have been constant sources of entertainment while I haven't been able to do much else. But this life standstill has also felt like another endless roundabout in an even longer journey to my goals. Today, though, I was able to do a bit more than in recent days. The Tall Man and I took advantage of this crisp autumn day -- a relief from recent rains -- and sojourned across the bridge into Boston. Our destination was one of my favorite cafes, Pavement Coffeehouse. Although I was exhausted by the time we got there, the aroma of freshly-brewed coffee cleared some of that brain fog. 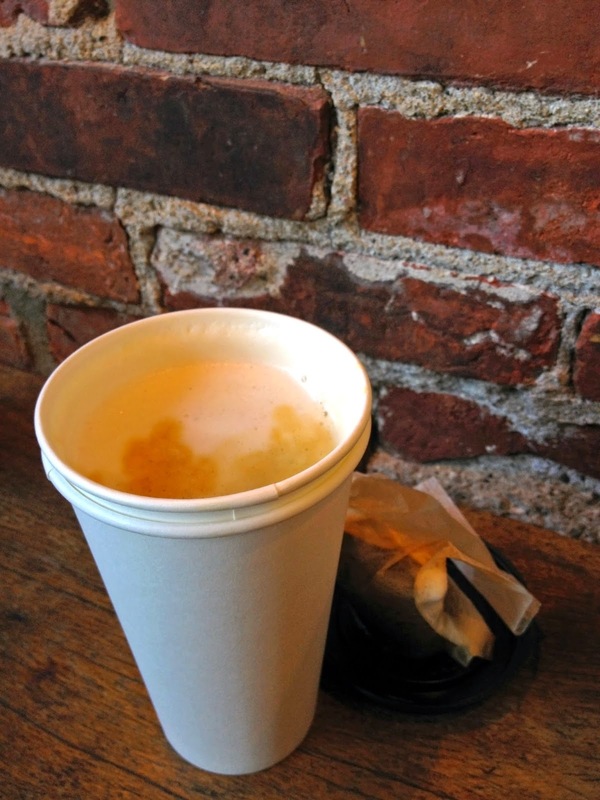 I knew I wanted tea -- after all, it was technically tea time -- but instead of my usual herbal option, I took a detour when the barista mentioned a drink called the "London Fog." It's really just a dressed up Earl Grey tea latte (with milk, vanilla, and perhaps a sweetener), but the name and the add-ins made it the perfect treat to crown this excursion. I had mine made with soy milk, so some might say this rendition was a cross between a Manchester Fog and Winter Fog (according to this list-happy Wiki). And the drink actually originated in Vancouver, Canada, despite its British-leaning moniker. Whatever. I didn't discover these facts until I returned home. In the moment, I just savored the sweet smells of vanilla and honey, intermixed with the citrus-y freshness of bergamot. It was in that moment that my friend's words came to mind. This little glimmer -- a London Fog moment right here and now -- was there to put some joy in my heart. I needed it. Or I needed to be able to see it. This honest poem by Kwasi Kena, professor at Wesley Seminary (and jazz pianist! ), well captures that delight of small discovery, of finding the divine in the mundane. Head to the Upper Room to read the full poem, included in one of their daily devotionals. It's worth it!